Many famous images of the inspirational, almost magical character of Confucian leadership seem very distant from any idea of democracy. Some modern Confucian celebrate this distance, arguing that modern Confucian polities should be ruled by elites, and perhaps that these elites should be venerated in something like the traditional way.3 Confucian democrats, in contrast, hold that the roles of Confucian political leaders must be rethought, just as the modern Confucian polity must shift from a monarchy to a constitutional democracy. 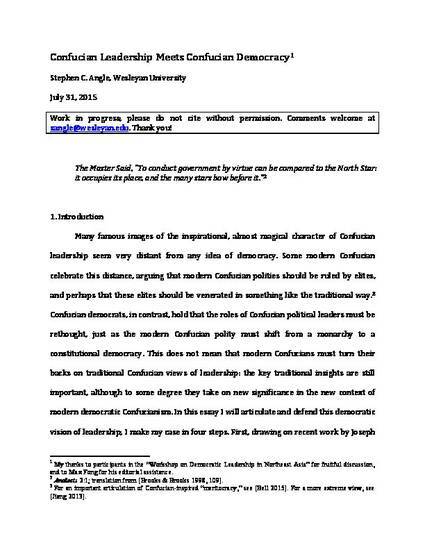 This does not mean that modern Confucians must turn their backs on traditional Confucian views of leadership: the key traditional insights are still important, although to some degree they take on new significance in the new context of modern democratic Confucianism. In this essay I will articulate and defend this democratic vision of leadership; I make my case in four steps. First, drawing on recent work by Joseph Chan and Elton Chan, I outline a traditional Confucian view of the “inspirational” leader, and examine the view that process and institutions played a decidedly secondary role in traditional Confucianism. Second, I unpack and then critique Jiwei Ci’s argument that Confucian leadership rests on an “identification model” of agency that is incompatible with democracy. Third, I build on some of the argument from my book Contemporary Confucian Political Philosophy: Toward Progressive Confucianism to the effect that modern Confucians need to resolve a tension within traditional Confucianism by embracing a person-based democracy instead of mass-based authoritarianism. Finally, I conclude by making explicit why Confucian democracies still need leaders playing roles that are very much in the spirit of traditional leadership.